Auvergne covers the northern part of the Massif Central. The region is home to a number of extinct volcanoes. Consequently, the landscape is dominated by mountain ranges with craters, lakes and rivers nestled in between. This beautiful, unspoilt countryside is dotted with chateaux and pretty villages. Winter in Auvergne is just as lively as the summer months as the mountains turn into ski slopes and hot water springs provide a relaxing means to wind down. Those wary of heights will be pleased to know that cross country skiing is still the most popular activity. Beware though, because whilst the climate is very pleasant in the summer but can be very cold in the winter. Auvergne is largely an agricultural region but tourism is gathering momentum and is rapidly becoming one of the region's key industries. Auvergne is known for its peace and quiet and has one of the lowest crime rates in the whole of France. Relatively few foreign buyers have installed themselves in Auvergne but with cheap property prices, this looks set to change. There used to be no international airports in the region, but Clermont-Ferrand now has seasonal flights with Flybe. 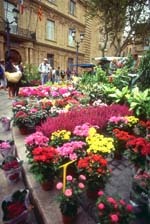 The nearest airports with regular UK services are Rodez, Lyon and Limoges. Lyon and Limoges also have TGV train stations. Do you know Auvergne better than we do? Do you have photos of Auvergne? Parisian and international buyers are only just beginning to see the immense potential this department has to offer with its rich Bourbonnais history. It is a peaceful department and has an economy which revolves mainly around agriculture and tourism. The volcanic and mountainous Cantal department, producer of the well known cheese, is great for those with a sense of adventure and a love of the outdoors. The Haute-Loire is the perfect antidote to the bustle of everyday life. The department is steeped in its medieval heritage and relics of its religious past. Volcanic landscapes give way to rolling fertile plains in which you will find some of the quaintest villages in France. The higher than average prices for the region are arguably justified by the physical and cultural variety that the region has to offer. The agricultural Puy-de-Dôme department is home to some breathtaking landscapes. Visitors will be struck by its contrasting scenery with volcanic mountain ranges overlooking rich pastureland and lakes. Despite its increasing popularity, properties here still represent real value for money. The town of Ambert, which lies to the south of central France, in the Auvergne region, benefits from a landscape of exceptional natural beauty. Ambert is in the very heart of the Parc Naturel Régional Livradois-Forez. This superb environment makes the town an absolute haven for nature lovers, walkers, cyclists and horse-riders. The town of Aurillac is the capital of the Cantal department in southern central France. Little known in comparison with many other departmental capitals, Aurillac is nevertheless a very attractive and vibrant town with an interesting history and a thriving economy. It lies in the wonderfully fertile and green rolling countryside of Cantal on the Massif Centrale. Bellerive-sur-Allier is a market town which lies on the edge of the famous spa town of Vichy, in central France. Somewhat overshadowed in the guide books by its larger and more famous neighbour, the little town is nevertheless a very pleasant place which offers some quality property at reasonable prices, and benefits from both its proximity to Vichy, and its more rural and attractive surroundings. The mediaeval village of Besse et Saint Anastaise is located in the Puy de Dôme department of the Auvergne region of central France. Although most people associate skiing with the Alps or the Pyrénées, Besse et Saint Anastaise is actually very close to the good ski slopes of the Massif Central, and could be an ideal location for keen skiers who are looking for something a little out of the ordinary. Bourbon l'Archambault is a beautiful medieval spa town that lies in the Allier department in the Auvergne region of central France. The town is the heart of the historic province of Bourbonnais, and has an imposing castle that was once the seat of the Bourbon family. Cérilly is a vibrant little town found amid the little known and utterly unspoilt countryside of the Auvergne region of central France. Complete with all amenities, Cérilly is an ideal spot for lovers of the great outdoors and beautiful scenery. In the Auvergne, tourism is unobtrusive and doesn't impinge on the very French lifestyle that is such a hallmark of the area. The university town of Clermont-Ferrand, situated in the southern part of central France, is a lively and forward-thinking university town. One of the oldest cities in France, dating back to around IV BC, the city today is a thriving and vibrant centre of industry and learning, with a confidence that comes from an assured knowledge of its place in history. Commentry is a town that is located in the Allier department of the Auvergne region is southern central France. Economically supported by the coal industry, Commentry is a thriving and vibrant town with excellent amenities, set in a lovely and little known area of France. The vibrant little market town of Cosne d'Allier is found right in the centre of France, on the confluence of three rivers. The area around the town is stunningly beautiful, with deep forests and lakes being a feature, and making it something of a sportsman's paradise. The town of Cournon d'Auvergne is located in the Puy-de-Dôme department of the Auvergne region in central France. Cournon is a large town, and although it is somewhat industrialised, it offers excellent amenities and is very well situated in attractive countryside beside the Allier River. The town of Gannat lies in the centre of France, in the volcanic region around the Massif Centrale. Less well known than its famous neighbour Vichy, Gannat is easily found from the A71 auto route, and is an interesting town which hosts a fabulous international festival of folklore every year. Issoire is a lively market town in central France, in the heart of the Auvergne region. The town has a renowned abbey church, which is well worth a visit, but there is much more to Issoire than just this. The town has an attractive southern feel, and offers visitors and residents plenty to do and see, with its excellent bars, restaurants and shopping facilities. La Bourboule is an attractive spa and ski resort town that is found in central France, in the Puy-de-Dôme department of the Auvergne region. With its pleasant aspect, picturesque setting and air of faded elegance, the town is a good base for winter sports fans who want to explore this lovely area and who want to avoid the crowds in the better known resorts of the Alps. Mont Dore is a spa town and ski resort that is found in southern central France, on the Massif Central. Elegant in its Belle Epoque architecture, Mont Dore lies in spectacular scenery and is full of zest for life in every season. The town of Le Puy-en-Velay, which lies in southern central France, is an ancient town which has long been an important stage on the pilgrim road to Santiago de Compostela. Le Puy-en-Velay has also had its own importance as a pilgrim town. This is due to the bronze statue of the Virgin which adorns the top of one of the volcanic peaks which dominate the town. It has attracted many pilgrims and proved an important factor in the town's rise to prominence. Lempdes is a pleasant town which is found in the volcanic landscapes of the Auvergne region in central France. Lying close to the regional capital city of Clermont Ferrand, Lempdes benefits from easy access to the city, yet has a more peaceful aspect. Maurs is a lovely mediaeval town set in the wild and beautiful countryside of the Cantal department of southern-central France. Rich in history and heritage, Maurs is also a vibrant market town with excellent amenities. Situated in Northern Auvergne, near the border with the Limousin and Centre-Val-De Loire, Montluçon has a population of just over 40,000 people. For years it has been the economic driving force for the whole Bourbonnais area and has learnt to adapt to the changing market needs of the 21st Century. The small market town of Montmarault is found in the fertile heart of France, in the Allier department of the Auvergne region. Situated in beautiful green countryside, with views of lovely valleys, hills and woodlands, Montmarault is untouched by excessive tourism and offers a delightfully peaceful location. Moulins is an historic town far enough off the beaten track to mean that very reasonable and attractive properties can be found. The vibrant market town of Saint Eloy les Mines is found in the heart of France, in the Puy de Dôme department of Auvergne. Saint Eloy is a bustling little town set against the lovely backdrops of this green and fertile region, occupying a prime position beside a beautiful lake. The town of Saint Gervais d'Auvergne is found in the Puy-de-Dôme department of the Auvergne region in southern central France. Set amid the volcanic landscapes and fertile earth of the region, Saint Gervais is a rural market town that is conveniently located for access to the main attractions of the area. The village of Saint Pourcain sur Sioule is located in central France. It lies amid the productive vineyards of the region which help to shape not just the economy of the town and its environs, but also the distinctive and beautiful landscape. The town is historic, with places of interest and importance, and also strongly cultural, hosting events throughout the year. The wonderfully named Saint Rémy de Blot is a small village... little more than a hamlet really...that is located in central France, in the department of Puy de Dôme. Perfect for those who want to live a rural lifestyle and escape the stresses and strains of modern city life, Saint Rémy de Blot offers unrivalled peace and tranquillity in a truly beautiful setting. Set in the lovely, unspoilt countryside of the Cantal department in south-central France, the village of Sansac de Marmiesse awaits discovery. Calm and traditional, the village has local amenities yet retains a rural feel. It's close to many of the area's main attractions too, including a great golf course. The town of Souvigny lies in the green and unspoilt countryside of the Allier department of the Auvergne region of central France. The town's rich history, which links it to the Abbey of Cluny, has left a fascinating legacy of heritage. And, Souvigny is packed with mediaeval character and charm. The city of Thiers, which lies in the southern centre of France, on the fertile, volcanic terrain of the Massif Central, is notable as a major producer of knives. Frequently referred to as the knife town, cutlery making here is much more than just an industry... it is a whole culture. Thiers has a dramatic location on the edge of a vast ravine and the city also boasts some fabulous architecture. Vichy is a famous spa town whose elegance and cultural heritage make it a fascinating place to visit, or indeed in which to live. Property here should prove a good investment as Vichy remains a popular destination with the fashionable set. Auvergne is in the heart of France - its southern border is shared with Languedoc-Roussillon and Midi-Pyrénées. WHICH DEPARTMENTS ARE IN Auvergne?